� After not advancing from the qualifier in his first 13 events, Stolfus had just one event since making his first main draw in which he did not advance. � Stolfus and Loomis became the first U.S. men's team to medal in the Pan Am Games when they placed second in 2007. � Stolfus was one of four AVP players (along with organizer Angie Akers, Ty Loomis, and Jenn Snyder) to visit U.S. Army troops in Kosovo in the summer of 2007. 2008: Played with five partners, including five times with Loomis to start the season and seven times with Jason Ring. Stolfus and Ring had a fifth in San Diego, marking the high finish for Stolfus on the year. 2007: Began the season playing five events with Scott Wong, with a best of seventh. Then he partnered with Loomis, and finished ninth, fifth, and third in their first three domestic events together. Stolfus was seventh on the tour in aces per game (.57). In July Stolfus and Loomis competed in the Pan Am Games in Brazil, and despite being seeded 14th became the first United States team to ever medel in this event with a second-place finish. 2006: Prior to the 2006 season he played in two tournaments on the Australian Pro Tour with Ty Loomis, and the pair finished third in an event before winning the Australian National Championships. 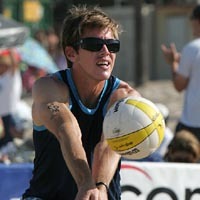 He formed a partnership with Aaron Wachtfogel, finishing ninth, fifth, and third in their first three AVP events. Stolfus had his first semifinal in Santa Barbara, and the duo also placed fifth in Hermosa Beach after knocking off top-seeded Phil Dalhausser and Todd Rogers. Stolfus finished the year as the 14th ranked player on tour. 2005: Prior to the season, competed on the Australian National Tour, winning one event. On the AVP, paired with Matt Olson for the first seven events, finishing ninth three times. He then played three events with Jason Lee, getting a ninth-place finish in their first outing together. Ended the season with one event with Olson. Stolfus was second in aces per game (.77) and was selected as the AVP Rookie of the Year. 2004: Stolfus played in eight events, advancing to his first main draw in what was his 13th qualifier, playing with Chris Kosty in Huntington Beach. He competed with David Smith for the final four tournaments, playing in the main draw in each of those with a best of 13th. 2003: Played in eight tournaments, half with Escobar and the other four with four different partners. Stolfus did not emerge from any of the qualifiers. 2002: Began his pro beach volleyball career in Manhattan Beach, playing in the qualifier with Esteban Escobar. He played one other qualifier that season with a different partner. Hot Winter Nights: Stolfus played in two Hot Winter Nights events in 2008, playing in the finals in both Minneapolis and Columbus, finishing second both times. In 2009 he played in one HWN event, in Cedar Falls, and was victorious. College: Began playing indoor volleyball after a $25 bet landed him in tryouts for the University of Hawaii's (# 1 ranked) Rainbows. Transferred to San Diego State University in 1998 (continued to major in Volleyball while minoring in English) and received a Bachelors Degree in 2000. Touched sand for the first time in 2001. Personal: Stolfus grew up in a small town in Eastern Iowa (near the Amana Colonies- huge tourist destination). He starved his way through the publishing process for his first fiction novel; he has been writing in one form or another since Mrs. Burmeister's 3rd grade class. Published first piece of writing (poem) in 2004 and currently writes for DiG Magazine, broadcasts color on AVP Radio, produces a podcast titled "Beach Volleyball Table-Talk" and blogs weekly on his website. Stolfus was All-State Table Tennis Iowa, 1986-1995. He was married to Melissa Powers in November 2008.